The last couple of days have been “bee days,” as they’re called in our household. Mama smells of smoke, and a honeybee inevitable gets into the house or a car or a bee suit (yikes). But it’s all good. The aim is to get all seven hives ready for winter. I have some strong queens there. Three Italians. Three out of the four Italian queens have been amazing. Even though first-year packages, they’ve given enough worker bees for three splits as well as 45+ lbs of excess “people honey”. If Borgia, Constanza and Beatrice make it through winter they’ll make for good production hives (honey makers) as well as for good genetic material for splits. The four on the right are mine (right to left: Borgia, Constanza, Beatrice and Katharina). The blue one all the way at the left end is a split (Tatjana). The other hives belong to two other “Common” beeks. Three Russians. Bianca was a bust early on, and after giving that colony a chance to requeen, Bianca’s daughter, Laura, lasted less than a month: she came back unmated and I had to cut off her head. I replaced her with a Russian, called Katharina, from Dan Conlon’s amazing outfit. Katharina is one of three queens Russians. Tatjana was given a split from a combination of frames and bees from the strong Italian hives on 6/25 (moved to the Home Yard for that purpose, then moved back to the Common in August). 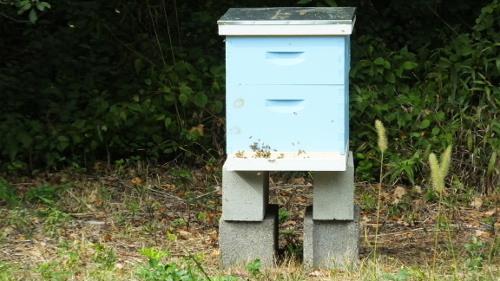 Anna was given a split from a combination of frames and bees from the same strong Italian hives on 7/9 and has remained in the Home Yard. One Mutt. The first split I did, from the same origin colonies, was made on 6/8 and to them I gave Queen Sam – a Sam Comfort “mutt.” They too remain in the Home Yard. After inspecting each hive, inventorizing their food stores, and checking for disease (sugar rolls on the three Italians, all under threshold which is a huge relief), and a couple of nifty bee escape moves, I had plenty of capped honey frames to distribute to those in need of it. The Italian populations are plenty large. They also have great honey stores, much of which they’ll need, being so large (typical of Italians), but much of which I felt fine robbing out to give to the weaker hives. Katharina’s colony is large enough too, but they didn’t have as much honey, so they got an extra super with robbed honey. 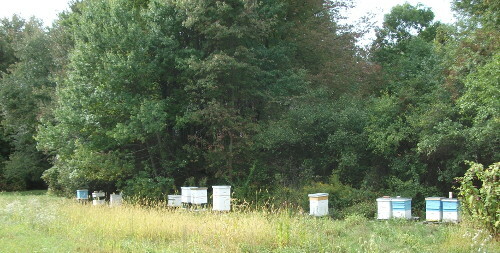 These four “big hives” each have one deep and two mediums for nest boxes. The idea is to switch to three mediums for nest boxes next year. The deeps are just too heavy for me to lift, and mixing deeps and mediums is a hassle as the frames aren’t interchangeable. Come spring, these colonies should have moved up into the two mediums. I plan to use the drawn out deep frames for nucs to sell. The splits, Sam and particularly Tatjana and Anna, are understandably smaller, and hence they are housed in one deep and just one medium. But I’m not worried. Sam’s population is large enough, and the latter two are Russians and they’re supposed to be more “conservative”: they have smaller populations going into winter and need less honey to make it through. Still, they got some from the Italian honey hives. With all this honey, I won’t have to feed sugar, of which I’m glad. I’ll be ready, though, to give it them if they need it. Tatjana, a split from the Italians with a Russian Queen, split on 6/25 and moved to the Home Yard, then moved back into the Common on 8/29. Home Yard: Anna (split on 7/9) on the right, Sam (split on 6/8) on the left. A super being robbed out of uncapped honey and protected from the recent rain by an outer cover, leaning against Sam’s hive). I need to close the screened bottom boards and/or replace them with solid bottom boards. I also plan to give each a candy/quilt winter box, like the ones I made last year (see here). That way they’ll have ventilation and moisture control, and should any of them be in need of candy, I’ll have a place to put it. I also plan to wrap each of them, like I did last year as well (see here). I have some time for that, still, but I’ll try not to underestimate the time it takes to cut all those insulation boards, and to actually do the wrapping. I plan to split each surviving hive at least once as soon as they are ready for it – which will also prevent swarming. The early ones will have to make their own queens, as no local queens will be available yet that early in spring and the whole point is not to get queens from elsewhere. I also plan to start rearing queen (I’ve got all the toys-I-mean-tools ready). I aim to rear lots of bees so I can offer my local beeks local nucs and local queens. But it will also be good to have a couple of production hives to make some honey money to offset at least some of the costs of the whole operation. Fingers crossed for a mild winter, and especially one that doesn’t have a deep arctic blast at the end of it!